In orthodox Mormonism, the term God generally refers to the biblical God the Father, whom Mormons sometimes call Elohim, and the term Godhead refers to a council of three distinct divine persons consisting of God the Father, Jesus (his firstborn Son, whom Mormons sometimes call Jehovah), and the Holy Ghost (Holy Spirit). Mormons believe that the Father, Son, and the Holy Ghost are three distinct beings, and that the Father and Jesus have perfected, glorified, physical bodies, while the Holy Ghost is a spirit without a physical body. Mormons also believe that there are other gods and goddesses outside of the Godhead, such as a Heavenly Mother who is the wife of God the Father, and that faithful Mormons may attain godhood in the afterlife. This conception differs from the traditional Christian Trinity in several ways, one of which is that Mormonism has not adopted or continued the doctrine that the Father, Son, and Holy Spirit are of the same substance or being. Also, Mormonism teaches that the intelligence dwelling in each human is coeternal with God. While Mormons use the term omnipotent to describe God, and regard him as the creator, they do not understand him as having absolutely unlimited power, and do not teach that he is the ex nihilo creator of all things. The Mormon conception of God also differs substantially from the Jewish tradition of ethical monotheism in which elohim (אֱלֹהִים) is a completely different conception. This description of God represents the Mormon orthodoxy, formalized in 1915 based on earlier teachings. Other currently existing and historical branches of Mormonism have adopted different views of god, such as the Adam–God doctrine and Trinitarianism. Beginning in 1838, Joseph Smith taught that he had seen two personages in the spring of 1820. In 1843, Smith taught that these personages, God the Father and Jesus, had separate, tangible bodies. Most early Latter Day Saints came from a Protestant background, believing in the doctrine of Trinity that had been developed during the early centuries of Christianity. Before about 1835, Mormon theological teachings were similar to that established view. However, founder Joseph Smith's teachings regarding the nature of the Godhead developed during his lifetime, becoming most fully developed in the few years prior to his murder in 1844. Beginning as an unelaborated description of the Father, Son, and Holy Spirit as being "One", Smith taught that the Father and the Son were distinct personal members of the Godhead as early as 1832. Smith's public teachings later described the Father and Son as possessing distinct physical bodies, being one together with the Holy Ghost, not in material substance, but in spirit, glory, and purpose–a view sometimes called social trinitarianism. Mormons view their concept of the Godhead as a restoration of original Christian doctrine as taught by Christ and the Apostles. Elements of this doctrine were revealed gradually over time to Smith. Mormons teach that in the centuries following the death of the Apostles, views on God's nature began to change as theologians developed doctrines and practices, though they had not been called as prophets designated to receive revelation for the church. Mormons see the strong influence of Greek culture and philosophy (Hellenization) during this period as contributing to a departure from the traditional Judeo-Christian view of a corporeal God in whose image and likeness mankind was created. These theologians began to define God in terms of three persons, or hypostases, sharing one immaterial divine substance, or ousia—a concept that some claim found no backing in scripture, but closely mirrored elements of Greek philosophy such as Neoplatonism. Mormons believe that the development process leading up to the Trinity doctrine left it vulnerable to human error, because it was not founded upon God's established pattern of continued revelation through prophets. The Book of Mormon teaches that God the Father, and his Son Jesus Christ, and the Holy Ghost are "one", with Jesus appearing with a body of spirit before his birth, and with a tangible body after his resurrection. The book describes the "Spirit of the Lord" "in the form of a man" and speaking as a man would. I would that ye should understand that God himself shall come down among the children of men, and shall redeem his people. And because he dwelleth in flesh he shall be called the Son of God, and having subjected the flesh to the will of the Father, being the Father and the Son—the Father, because he was conceived by the power of God; and the Son, because of the flesh; thus becoming the Father and Son—and they are one God, yea, the very Eternal Father of heaven and of earth. Father, thou hast given them the Holy Ghost because they believe in me; and thou seest that they believe in me because thou hearest them, and they pray unto me; and they pray unto me because I am with them. And now Father, I pray unto thee for them, and also for all those who shall believe on their words, that they may believe in me, that I may be in them as thou, Father, art in me, that we may be one. The Book of Mormon states that Jesus, the Father and the Holy Spirit are "one". The LDS Church interprets this "oneness" as a metaphorical oneness in spirit, purpose, and glory, rather than a physical or bodily unity. On the other hand, some Latter Day Saint sects, such as the Community of Christ, consider the Book of Mormon to be consistent with trinitarianism. 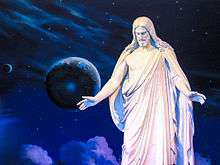 Some scholars have also suggested that the view of Jesus in the Book of Mormon is also consistent, or perhaps most consistent, with monotheistic Modalism. That the Son is "filled with the fullness of the Mind of the Father, or in other words, the Spirit of the Father" (5:2o). Lectures on Faith were included as part of the 1835 Doctrine and Covenants. They were eventually removed from the Doctrine and Covenants by the LDS Church and the Community of Christ on the grounds that they had never explicitly been accepted by the church as canon. Most modern Latter Day Saints do not accept the idea of a two-"personage" Godhead, with the Father as a spirit and the Holy Spirit as the shared "mind" of the Father and the Son. Moreover, many Mormon apologists propose a reading of Lectures on Faith that is consistent with Smith's earlier or later doctrines, by putting various shadings on the meaning of personage as used in the Lectures. In 1838, Smith published a narrative of his First Vision, in which he described seeing both God the Father and a separate Jesus Christ, similar in appearance to each other. In the endowment ceremony, introduced by Smith in 1842, the name "Elohim" is used to refer to God the Father. "Jehovah" is used to refer to the pre-mortal Jesus. In public sermons later in Smith's life, he began to describe what he thought was the true nature of the Godhead in much greater detail. In 1843, Smith provided his final public description of the Godhead before his death, in which he described God the Father as having a physical body, and the Holy Spirit, also, as a distinct personage: "The Father has a body of flesh and bones as tangible as man's; the Son also; but the Holy Ghost has not a body of flesh and bones, but is a personage of Spirit. Were it not so, the Holy Ghost could not dwell in us." Even though this quote is included in canonized LDS scripture, some dispute its authenticity, particularly that of the Holy Ghost dwelling in us, since it was not consistent with the manuscript source's wording about the Holy Ghost and underwent various revisions and modifications before arriving at this final form. During this period, Smith also introduced a theology that could support the existence of a Heavenly Mother. The primary source for this theology is the sermon he delivered at the funeral of King Follett (commonly called the King Follett Discourse). The LDS Church believes that a Heavenly Mother exists, but very little is acknowledged or known beyond her existence. Lorenzo Snow succinctly summarized another portion of the doctrine explained in the King Follett Discourse using a couplet: "As man now is, God once was: / As God now is, man may be." The Church of Jesus Christ of Latter-day Saints (LDS Church) holds Joseph Smith's explanation of the Godhead as official doctrine, which is to say that the Father and the Son have glorified physical bodies, while the Holy Ghost has only a body of spirit. The differences between the Mormon doctrine of the Godhead and that of Trinitarianism have set Mormonism apart, for which some Christian denominations reject Mormonism as a Christian faith. Leaders and scriptural texts of the LDS Church affirm a belief in the Holy Trinity but use the word "Godhead" (a term used by the Apostle Paul in Acts 17:29; Romans 1:20, and Colossians 2:9) to distinguish their belief that the unity of the Trinity relates to all attributes, except a physical unity of beings. Church members believe that "The Father has a body of flesh and bones as tangible as man's; the Son also; but the Holy Ghost has not a body of flesh and bones, but is a personage of Spirit." According to LDS teachings, this theology is consistent with Smith's 1838 and subsequent accounts of the First Vision. These accounts state that Smith saw a vision of "two personages", the Father and the Son. Mormon critics view this 1838 account with skepticism, because Smith's earliest accounts of the First Vision did not refer to the presence of two beings. The church also teaches that its theology is consistent with the Biblical account of the baptism of Jesus which referred to signs from the Father and the Holy Spirit, which the denomination interprets as an indication that these two persons have distinct substance from Jesus. Smith taught that there is one Godhead and that humans can have a place, as joint-heirs with Christ, through grace, if they follow the laws and ordinances of the gospel. This process of exaltation means literally that humans can become full, complete, joint-heirs with Jesus and can, if proven worthy, inherit all that he inherits. Though humanity has the ability to become gods through the Atonement of Jesus, these exalted beings will remain eternally subject to God the Father and "will always worship" Him. Among the resurrected, the righteous souls receive great glory and return to live with God, being made perfect through the atonement of Christ. Thus, "god" is a term for an inheritor of the highest kingdom of God. LDS Church president Gordon B. Hinckley offered a declaration of belief wherein he reaffirmed the teachings of the church regarding the distinct individuality and perfect unity of the Father, the Son, and the Holy Ghost. Trinitarianism has been adopted by the Community of Christ, which is part of the Latter Day Saint movement, but not part of Mormonism. Mormon fundamentalists seek to retain Mormon theology and practice as it existed in the late 19th century. As such, the faith accepts the Adam–God doctrine, which identifies God the Father with Adam. Within Mormon fundamentalism, Jehovah and Jesus are considered distinct and separate beings. In the Restoration Church of Jesus Christ, a liberal Mormon faith, the Heavenly Mother is accepted as a full member of the Godhead. Thus, the RCJC believes in a quadriune Godhead; the Godhead is referred to as the Holy Quaternity. Prayers are addressed to the Heavenly Parents in the name of Jesus Christ. Latter-day Saints believe in an eternal cycle where God's children may progress to become "heirs of God and joint-heirs with Christ" (Romans 8:17) and thus become one with God or like God. This is commonly called exaltation within the LDS Church. In addressing this issue, former church president Gordon B. Hinckley, noted the church believes that man may become as God is. Hinckley said that growth, learning and gaining intelligence are eternal principles, and is one of the reasons why education is important to members of the LDS Church. Previous prophets or leaders of the church have made statements about their personal beliefs about exaltation. Joseph Smith taught, and Mormons believe, that all people are children of God. Smith further stated in the King Follett discourse that God was the son of a Father, suggesting a cycle that continues for eternity. ↑ Alexander (1980, online p. 1). ↑ Bushman (2008, p. 6) (Mormons believe in what is sometimes called "social trinitarianism," meaning the three beings of the Godhead are blended in heart and mind like extremely close friends, but are not one being); Early passages in Smith's revelations could be interpreted as traditionally trinitarian, but the doctrine of three Gods in one soon gave way to a Father, Son and Holy Ghost, three distinct beings united in purpose and will but not in substance. See also: D&C 130:22. ↑ Salai, Sean S.J. (2015-08-19). "Catholic and Mormon: Author Q&A with Professor Stephen H. Webb". America. Retrieved 19 August 2015. Mormons emphasize the relative independence of the three divine persons of the Trinity. Many theologians today, whatever their church tradition, are developing what is called a "social Trinity," which is very similar to Mormonism in seeing the Trinity as a society of persons rather than a single immaterial substance defined by a set of internal relations. ↑ Butler, Shanna (February 2005). "What Happened to Christ's Church?". Liahona. LDS Church. Retrieved 2014-02-24. ↑ Draper, Richard D. (April 1984). "The Reality of the Resurrection". Ensign. LDS Church. Retrieved 2014-02-24. ↑ "Doctrinal Trends in Early Christianity and the Strength of the Mormon Position" (PDF). Fairmormon.org. Retrieved 2014-02-24. ↑ Thomas Mozley "The Creed, or a Philosophy" 1893 p 303. ↑ Widmer (2000, p. 6). ↑ "Mother in Heaven", lds.org, accessed 13 April 2016. ↑ Spencer W. Kimball, "The True Way of Life and Salvation", Ensign, May 1978, p. 4. ↑ Doctrine and Covenants 130:22. ↑ Kurt Widmer, Mormonism and the Nature of God: A Theological Evolution, 1833-1915 (Jefferson, NC: McFarland & Company, p. 2000), 92. ↑ Lattin, Don (April 13, 1997). "SUNDAY INTERVIEW -- Musings of the Main Mormon / Gordon B. Hinckley, 'president, prophet, seer and revelator' of the Church of Jesus Christ of Latter-day Saints, sits at the top of one of the world's fastest-growing religions". San Francisco Chronicle. Retrieved July 16, 2012. Q: There are some significant differences in your beliefs. For instance, don't Mormons believe that God was once a man? A: I wouldn't say that. There was a little couplet coined, "As man is, God once was. As God is, man may become." Now that's more of a couplet than anything else. That gets into some pretty deep theology that we don't know very much about. Q: So you're saying the church is still struggling to understand this? A: Well, as God is, man may become. We believe in eternal progression. Very strongly. We believe that the glory of God is intelligence and whatever principle of intelligence we attain unto in this life, it will rise with us in the Resurrection. Knowledge, learning, is an eternal thing. And for that reason, we stress education. We're trying to do all we can to make of our people the ablest, best, brightest people that we can. Bergera, Gary James, ed. (1989), Line Upon Line: Essays on Mormon Doctrine, Salt Lake City: Signature Books . Calabrese, Joseph; Lovalvo, V James; Watson, Robert A; Committee on Special Affairs, Church of Jesus Christ (Bickertonites) (1977), Questions and Answers, Monongahela, Pennsylvania: The Church of Jesus Christ, OCLC 42380350 . Charles, Melodie Moench (1993), "Book of Mormon Christology", in Metcalfe, Brent Lee, New Approaches to the Book of Mormon, Salt Lake City: Signature Books, pp. 81–114 . Dahl, Paul E. (1992), "Godhead", in Ludlow, Daniel H., Encyclopedia of Mormonism, New York: Mcmillan, pp. 552–53, ISBN 0-02-904040-X . Ford, Clyde D. (May 5, 2007), "Jesus and the Father: The Book of Mormon and the Early Nineteenth-Century Debates on the Trinity" (PDF), Dialogue: A Journal of Mormon Thought (Dialogue Paperless 6) . Hale, Van (1978), "The Doctrinal Impact of the King Follet Discourse", BYU Studies, 18 (2): 209 . Kimball, Spencer W. (May 1978), "The True Way of Life and Salvation", Ensign: 4 . Kirkland, Boyd (1984), "Jehovah as the Father: The Development of the Mormon Jehovah Doctrine" (PDF), Sunstone, 44 (Autumn): 36–44 . Kirkland, Boyd (1986), "Elohim and Jehovah in Mormonism and the Bible", Dialogue: A Journal of Mormon Thought, 19 (1): 77–93 . "Chapter 2: Our Heavenly Family", Gospel Principles, LDS Church, 2009 . Lovalvo, V. James (1986), A Dissertation on the Faith and Doctrine of The Church of Jesus Christ, Monongahela, Pa: The Church of Jesus Christ, OCLC 20377503 . McMurrin, Sterling M. (1977) , The Theological Foundations of the Mormon Religion, Salt Lake City: University of Utah Press, ISBN 9780874800517 . Volluz, Corbin (2006), "Jesus Christ as Elder Brother", BYU Studies, 45 (2): 141–58 . Widmer, Kurt (2000), Mormonism and the Nature of God: A Theological Evolution, 1830-1915, Jefferson, NC: McFarland, p. 6, ISBN 978-0-7864-0776-7, OCLC 43615415 . Skinner, Andrew C. (2003). "The Doctrine of God the Father in the Book of Mormon". A Book of Mormon Treasury: Gospel Insights from General Authorities and Religious Educators. Provo, Utah: Religious Studies Center, Brigham Young University. pp. 412–26. ISBN 1-59038-099-1. Matthews, Robert J. (1988). "What the Book of Mormon Tells Us about Jesus Christ". In Cheesman, Paul R. The Book of Mormon: The Keystone Scripture. Provo, Utah: Religious Studies Center, Brigham Young University. pp. 21–43. ISBN 0-8849-4637-1.